The Jefferson memorial is one of the most iconic spots on the National Mall in Washington DC. The monument is created from gorgeous white and pink marble and is situated with a direct view towards the Washington Memorial. This is one of my most requested location in DC for wedding and portrait photographs. I absolutely love arriving early in the morning when crowds are low and my couple and I can have the entire monument to ourselves. When the sun rises in this location it's breathtaking and almost seems to glisten against the white marble. 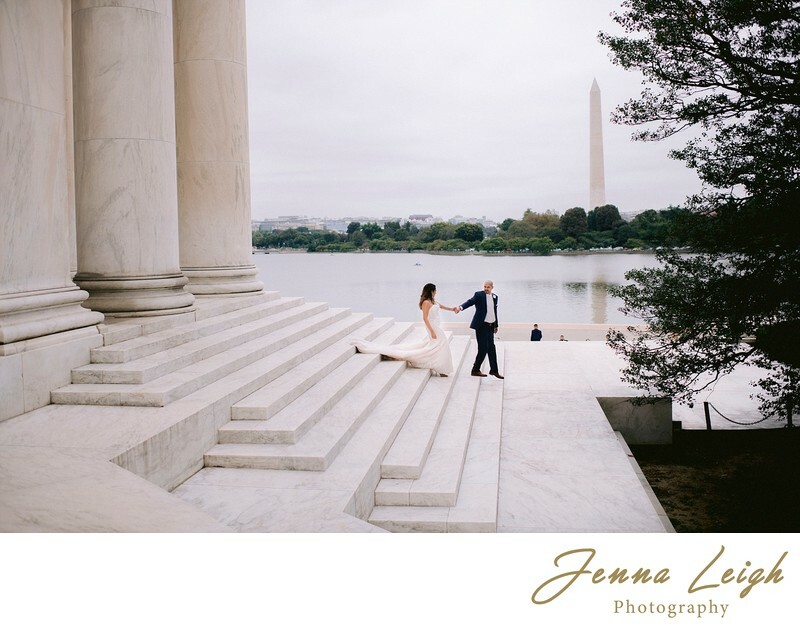 Surrounding the Jefferson memorial is the beautiful tidal basin and a sprawling landscaped area that offer further photography backdrops that couples love. A stroll around the tidal basin is lots of fun and a great time for me to talk and get to know my couples before their wedding day. Location: The Jefferson Memorial Washington DC .